I research for family and friends history about photographs and WWII helmets etc. I have a photograph here Soldier from Austria church "Bezirk Leibnitz, Steiermark, Österreich", died maybe 1945. His name is DAVID FRÜHWIRTH. He looks young. Can anyone tell me more about him from his uniform, etc? Thank you! and it is important soon it be found, please! Pionier (engineer) David Frühwirth, born June 2, 1924 in Oberdorfberg/Austria. KIA January 5, 1944 near Kriwoi Rog/Ukraine. 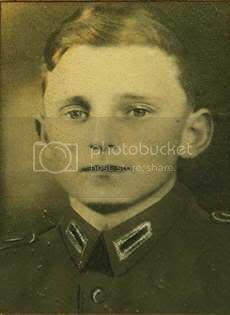 Location of his grave is unknown, it was not possible to transfer the mortal remains to a German military cemetery yet. P.S. the uniform should be RAD (Reichsarbeitsdienst/Reich Labour Service). The German War Graves Commission (Volksbund Deutsche Kriegsgräberfürsorge) is your friend.